In the Intro to my blog I’ve stated that my blog’s going to be about my four major passions: art, writing, walking and singing. (I know that to get ‘professional’ you’re supposed to whittle down your blog to one ‘niche’ subject, but my niche is a nest of many niches, so I can’t! And I don’t want to anyway). In my most recent blog I mentioned that I hadn’t yet talked about my major work in progress writing-wise, i.e. my mystery novel series, The Laurel Grove Mysteries. I haven’t talked much about singing, either. Well a few years ago I was approached to join a new choral group starting up that was to be for the benefit of the Paris Croix Rouge. The HQ for the Red Cross in Paris is in what used to be an Hotel (as in Hotel de Ville, i.e. the Paris Town Hall and NOT as in the Paris Hilton). 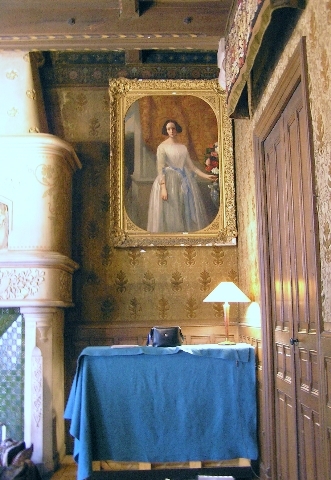 I never did manage to find out who had once lived in this grand house, which is situated in the rue de Passy, in the 16th arrondissement, nor the identity of the dark-haired beauty in the portrait above the piano. Beyond the blue entrance door, the house was in the process of being gutted out (there was a digger in the entrance hall all the time I was visiting for rehearsals) and the room in the photo has almost certainly by now been torn apart and made functional. Shame really. The ceiling was coffered in a lovely warm oak and each square hand-decorated. I enjoyed singing there. The first piece we began rehearsing was Mozart‘s Ave Verum Corpus. I got into trouble straight off when, having been asked to learn the alto part, to balance out the choir, I forgot (being a soprano) and automatically learned the part for soprano instead! It’s an incredibly beautiful piece of music, as you’ll agree if you click on the link in the Ave Verum Corpus phrase above, which links to a You Tube video of the piece being conducted, and so passionately, by Leonard Bernstein. I must have watched this video a million times and never tired of it. My neighbours probably did. The opportunity for voice lessons came up when I joined this choir. I leapt at the chance as it’s something I have longed for. My first lessons took place in another part of Paris, then they shifted to this rehearsal room in Passy. I duly arrived for the first, which was at noon. I was half way up a scale when the huge oak door to the room was thrown open. A young woman stood in the doorway, her face puce with rage. She proceeded to pour out a torrent of abuse, the gist of which was that she was trying to work next door and couldn’t concentrate because of the bruit infernal. I burst into tears, my professeur was outraged and rang someone to come and remove her piano from the premises and like Elvis after a concert in Las Vegas, we left the building. After that, I became ‘la voix infernale’ (the infernal voice). Hey, I could sympathise with the poor girl. She’d had a succession of infernal voices all morning, running up and down the same scales. Scales are meant to be beautiful, but not pretty and what happens between the two isn’t something you want to inflict on anyone! My training followed the Vaccaj Metodo Pratico Di Canto. When I started lessons, my professeur told me, later, I had 10 faults to correct. (Only 10)? When I left Paris to return to live in the UK last year, she said there were only 3 faults remaining. Unfortunately, I failed to ask what they were, but they are clearly very important ones! One of them is, I think, that I forget to smile when singing. This is not so as to appease the tortured audience, but to help lift the voice into the mask – that’s the place you’re supposed to sing – the front of the face – through all the lovely, resonating cavities that exist there. Mind you, I was puzzled when the smiling thing was first put to me, as I was in the middle of Vaccaj’s second arrietta: Semplicetta tortorella. It’s subtitled: Innocent dove, unconscious of its peril, in order to avoid the eagle’s claw flies into the hunter’s clutches. Well, it didn’t seem appropriate to be grinning my way through these lyrics somehow. But eventually I learned that the sadness is already built into the song by the composer and all I had to do was sing the notes as written. (All)? I’ve just joined my first choral society since returning to England, the Rochester Choral Society for which I auditioned last week. I decided to sing the hymn from Sibelius’ Finlandia, in French since I was singing that in Paris last year. I chose it because it was the easiest piece of music I could find and I only needed sing the first verse! The choral is rehearsing Haydn’s Oratorio: The Creation. I chose the video at the top of my blog as it’s a film of a rehearsal and also it’s a part of the piece I especially like, in particular that great loud note on the word L -I -G – H – T. It just about blows your head away, that note and it’s not very often one is authorised to belt, so the most is made of it! There’s a performance in Rochester Cathedral on 5 November 2011, so if you are anywhere near Rochester, come! I can even sell you the tickets. Afterwards, being November 5th, there will be fireworks, of course, celebrating the execution of Guy Fawkes, who tried to blow up the House of Lords in The Gunpowder Plot in 1605. You’d have thought we’d have got over it by now. Apparently not. Had I not been singing, we’d have driven to Lewes, in Sussex, where they really make a fuss of Guy Fawkes Night, not just burning an effigy of Guy Fawkes, but of the Pope, which is first paraded, in flames, through the town. I wonder what the local catholic priest does on November 5th. Joins in? Or slips quietly out of town under cover of darkness! I’ll soon be writing about the 8 hour walk I did last Sunday, discovering that 8 hours is about my limit for walking and that my Merrill walking shoes are amazing! This entry was posted in Music, Singing and tagged Ave Verum Corpus, Guy Fawkes, Haydn, Haydn's Creation, Leonard Bernstein, Lewes, Mozart, Passy, Rochester Choral Society. Bookmark the permalink. I enjoyed reading this article. Know what–the lighthearted writing style held my attention. You write happily. I can relate with your “infernal” experience in one of your music lessons. Some people are not into music as I am, I guess. Back then, when I try to practice on the church piano, some naughty neighbor stones the church G.I. roof every time I try to master the piece by repeatedly playing it. Oh, well, that’s life. You can’t please everybody LOL. Nice to come across your blog. I’m going to mention ‘graphic notation’ soon. Watch this space!